Low Carb Smashed Brussel Sprouts with Pancetta! Addictingly Delicious! You are here: Home / Low Carb / Low Carb Smashed Brussel Sprouts with Pancetta! Addictingly Delicious! This smashed brussel sprouts recipe makes one of the best low carb side dishes EVER! These aren’t the traditional brussel sprouts that haunt your dinner table memories from childhood. No way! These bad boys have a rich, complex flavor that’s anything BUT bitter, and they’re just so easy to make! So delicious, you won’t even know you’re eating greens, and your body will thank you for it. 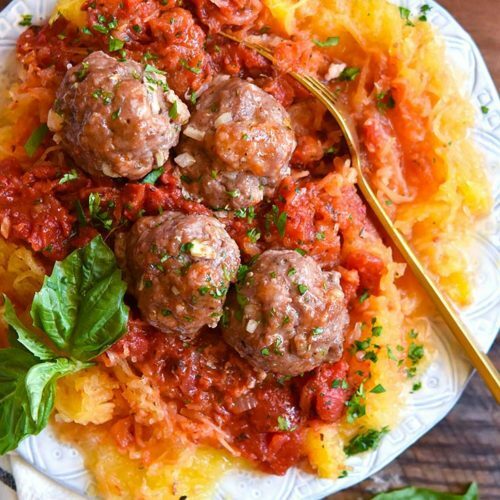 By simply baking these little low carb vegetables, we’ll bring out their slightly sweet and more balanced flavor profile, while cutting down on their naturally bitter taste. We’ll then toss them in a few other goodies to really kick this dish’s flavor up a few notches! 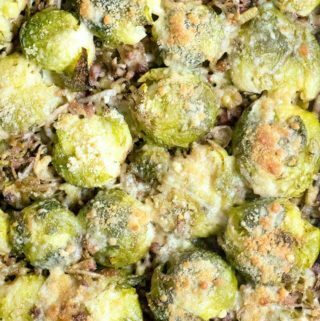 Simply saying “brussel sprouts” makes some people cringe, but those are the ones who haven’t had the pleasure of tasting this decadent recipe! These smashed brussel sprouts don’t even taste like greens, but your body will know the difference. Brussel sprouts are rich in Vitamin C, loaded with fiber and they’re even high in protein compared to other leafy greens. I mean, they could sport little veggie capes. Really! Eating brussel sprouts, even these smashed brussel sprouts, feeds your body the nutrient dense food it craves, so go on and add this recipe to your low carb meal prep plan! First, you’ll want to choose beautiful, bright green brussel sprouts. Avoid ones with yellow leaves or brown spots. Choosing sprouts of a similar size will help them cook more evenly, as opposed to grabbing mammoth sized sprouts along with teeny ones. You’ll want to be sure to thoroughly clean the leeks, as their natural shape allows them to hide dirt and grit — I like to wash/soak them in a bowl of water after slicing them to get all the dirt out. Cutting off the dark green parts of the leeks will ensure you get a tender product that cooks evenly and enhances your dish. You’ll also want to trim off the little beards at the bottom, they are just the roots. Next, peel off the loose outer leaves and trim the stem. Longer stems tend to get really hard and woody, so keep it short and stubby. This will ensure that nothing gets in the way of that rich deep flavor with a mellow hint of sweetness. 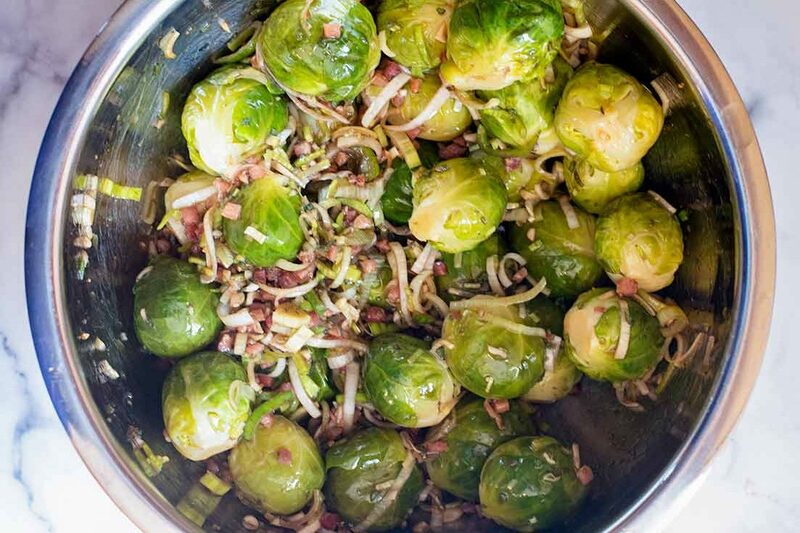 Steaming the brussel sprouts will soften them up and it gives you time to cook the pancetta. Drain the brussels and allow the pancetta to release excess grease on a paper towel lined plate. Now, throw together the sauce ingredients in a large bowl, and get ready to create flavor euphoria! Toss remaining ingredients into the sauce bowl and coat them in the dressing evenly, to ensure each bite is equally as delicious. Transfer the brussel sprouts to a baking sheet, leaving plenty of room between them. Don’t forget, you’ll be smashing them, so they’re going to spread out — Sometimes it’s easier to use two baking sheets. Use a mason jar, or sturdy glass to press the tops of each brussel sprout into a patty. 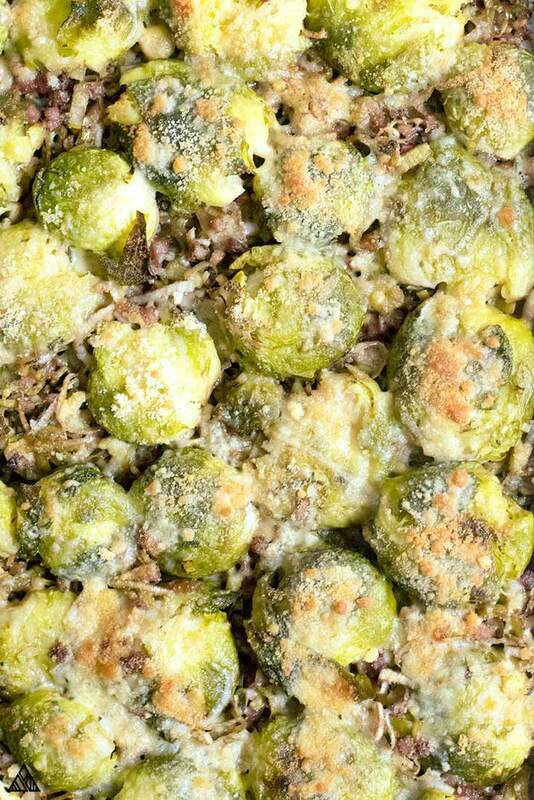 Cover the smashed brussel sprouts with parmesan. Preparing these smashed brussel sprouts is so simple and eating them is such a treat! You don’t necessarily have to smash the brussel sprouts, but if you leave them whole, they’ll take a little longer to cook. You can skip all mix ins for these roasted brussel sprouts, and top them with cheese for even easier keto side dishes. 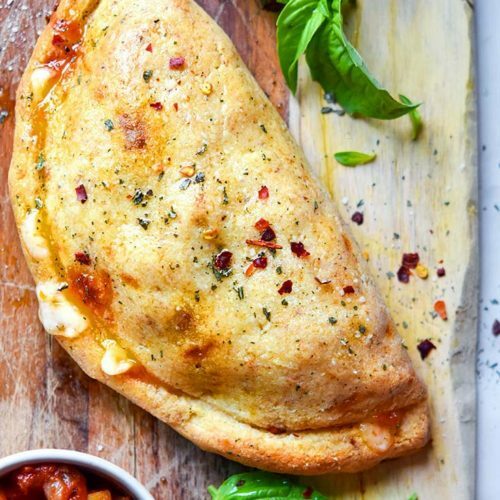 Skip the pancetta, if you’re looking for low carb vegetarian recipes. Add in a protein for more substantial low carb lunches. What to Serve with Low Carb Brussel Sprouts? 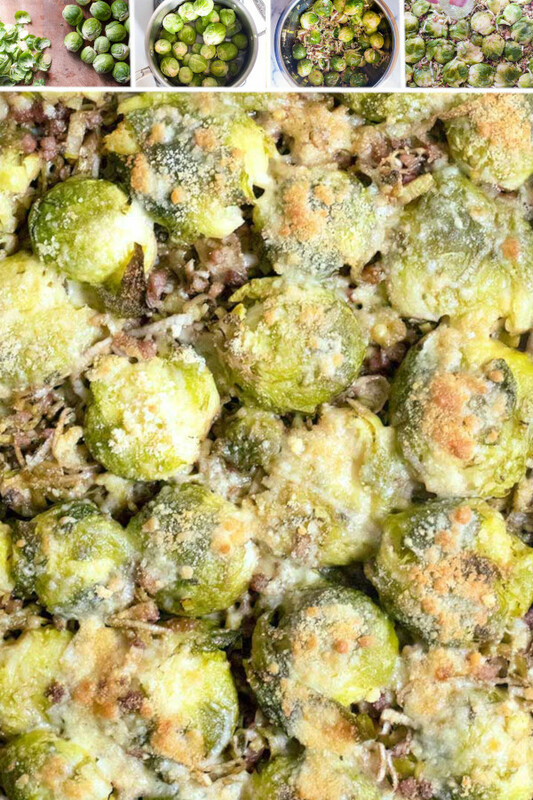 Serving low carb dinners with scrumptious smashed brussel sprouts will get everyone to the table for a family meal! Pair them with these delectable chicken stuffed peppers or ground chicken casserole for layers of flavor that’re SO lip smackin’ good! Turn your keto dinners into a nutrient landmine by serving these low carb brussel sprouts alongside a keto meatloaf, low carb chili, or any other hearty dish — what I’m getting at is, there really is no “wrong” meal to serve these smashed brussel sprouts with! On their own, these smashed brussel sprouts make for fantastic keto lunches or low carb snacks. Brussel sprouts aren’t typically at the top of anyone’s low carb shopping list, but adding these to your low carb meal plan means the kids (and you!) might actually eat their veggies without a battle! Honestly, eating these low carb smashed brussel sprouts with pancetta is like a rite of passage into yummy-land. 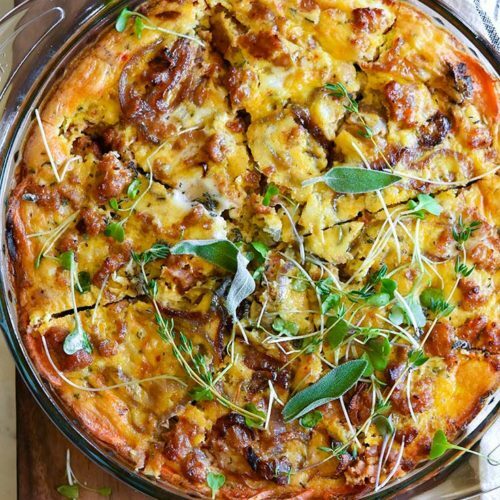 Adding this dish to your low carb meals can transform the hardest hearts from a cruciferous atheist to a leafy green lover! Just see for yourself. Try this low carb smashed brussel sprouts with pancetta recipe and hit me up in the comments below to let me know what you think! Enjoy! 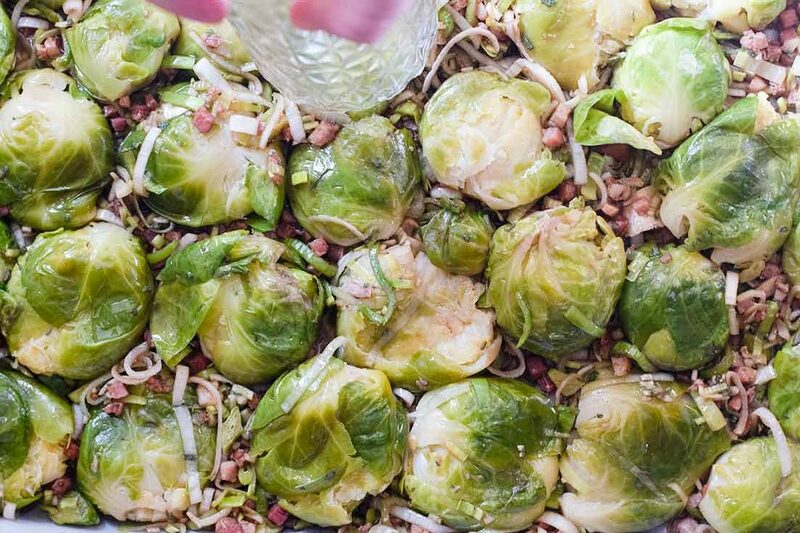 This smashed brussel sprouts recipe is a decadent combination of rich, layered flavors that will totally change your opinion of cruciferous vegetables. Trim the bottom of the brussel sprouts and discard yellow leaves. 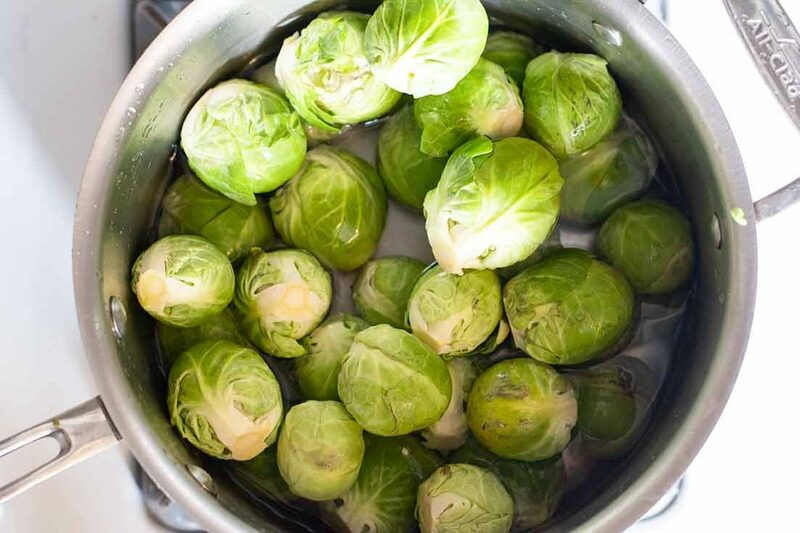 Steam the brussel sprouts for about 20-25 minutes, or until they’re tender. Allow brussels to drain in a colander while you prep the remaining ingredients. Meanwhile, cook the pancetta in a large pan over medium heat, about 10 minutes. Once cooked, allow pancetta to drain on a paper towel lined plate. In a large bowl, whisk together olive oil, balsamic vinegar, garlic, salt, pepper and sage. Add brussel sprouts, pancetta, leeks and sage and toss to coat evenly. 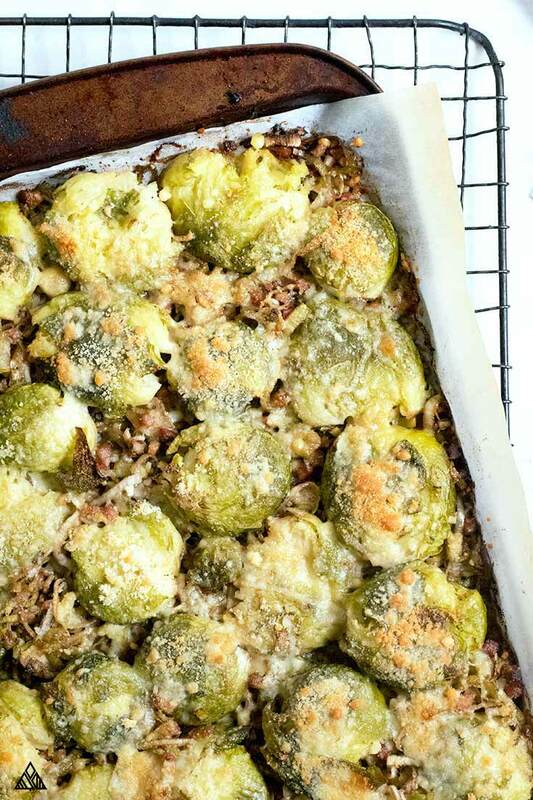 Spread brussel sprouts out onto a rimmed baking sheet. You want to leave room between the brussels as we’ll be “smashing” them — you may need to spread them out onto 2 baking sheets. Use a small mason jar (or cup), to press the brussel sprouts into flat patties. 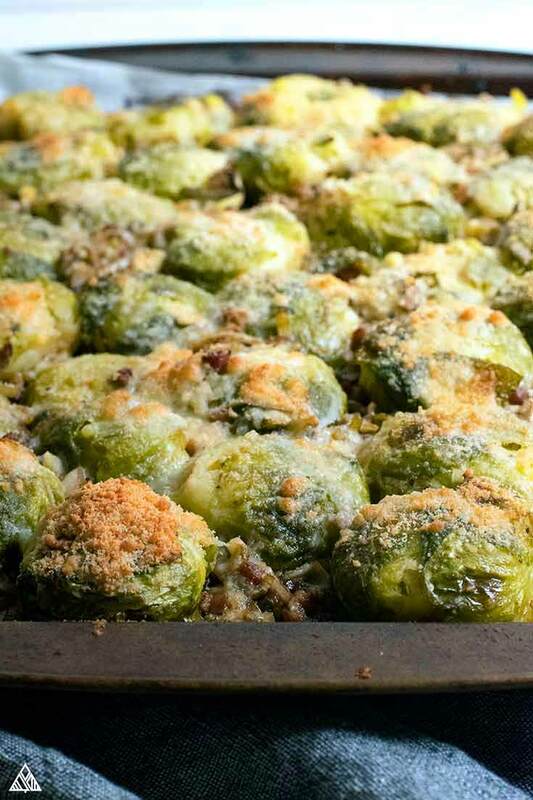 Cover brussel sprouts with parmesan. 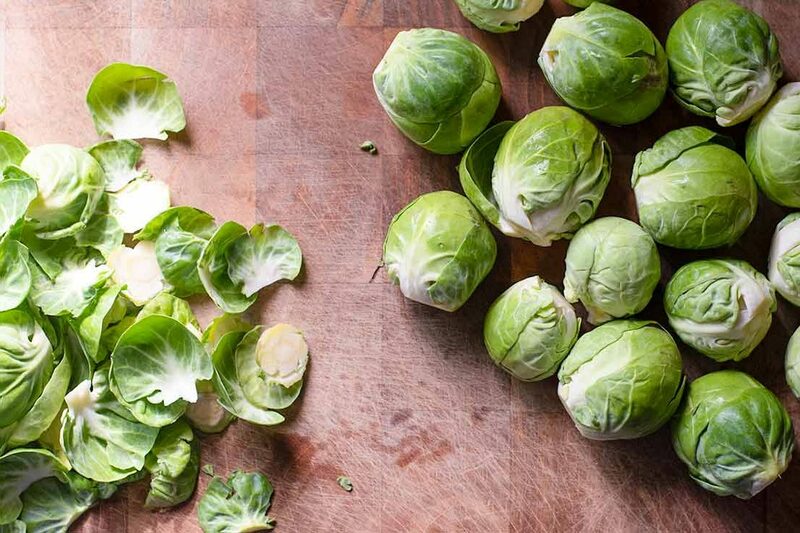 To save time: Boil the brussels as you chop, mix and cook the other ingredients. Nutritional information: nutritional information below is based on 1 serving, if you were to divide this recipe into 12 servings.